It’s Christmas whiskey time! By that I mean its the time of year I’m starting to buy gifts for family and friends and all I can think of is whiskey type gifts. I like to think I’m a selfless giver and Christmas is a time when I can give gifts to loved ones and family gifts they will love and enjoy. So to that end and I am giving them all Christmas whisky, hoping the dont like it and give it back to me! Mwa ha ha ha. This Christmas for myself Im trying something along the Christmas ‘white snow’ theme with a bottle of White Dog by Buffalo trace. The way I see it Christmas is a time for new starts, and the new year will no doubt bring fresh resolutions, so I thought my now try something new and fresh. And it doesn’t get much newer or fresher than this Christmas whisky new make! “New make” is technically not whisky, its just distillate, which comes directly out of the still at 60 odd percent and lands in a bottle for your delight. To be called proper american bourbon whiskey it would have to be aged a little in charred oak barrels; which is what this White Dog usually goes onto. So why buy this if it isn’t even proper whiskey? Well, for one, New make (or white whiskey) has a lot more flavor than you think. I had always imagined it being tasteless spirit something like vodka, but there is a suprising amount of nose, taste and finish in the RAW spirit. White Dog has a sweet, corny and very agricultural taste that puts me in mind of american corn fields, but that comes with a shotgun blast to the face of alcohol behind it (but then again it is 62.5%) which would be mellowed through aging. To me New Make whiskey on Christmas is an experiment. It’s a chance to experience whiskey in a new and unusual format which I love doing. I do have plans to buy the whiskey this spirit becomes which will be a nice view into how aging effects a spirit. This is a good spirit in my mind as it tastes quite nice actually, but when the wood barrels have their effect it makes a big difference, and its that difference I want to explore next. So I will be enjoying an experimental Christmas whiskey this Christmas as well as some rather more refined 30yo and 40yo speyside. But the White Dog is the one I’m most… intrigued by. I will let you all know how it goes in the comments, if you have tried it before, I would love to know your thoughts. You don’t actually want to drink that stuff. Not that there isn’t some FANTASTIC tasting “white dog” produced (like Four Roses and Woodford Reserve) but they are not sold as such. 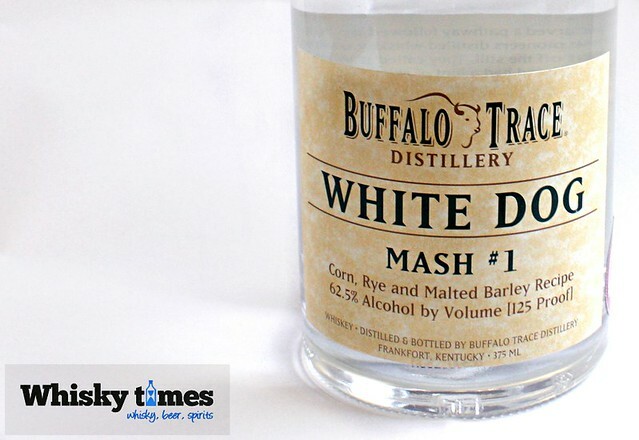 No, the best way to appreciate the Buffalo Trace White Dog is to include it in a tasting of Buffalo Trace or Eagle Rare Bourbons to dramatically experience the impact of wood, time and atmosphere on a distillate, because this is the distillate that goes in these bottles in 7, 10 or 17 years. Cheers for the comment, I agree having sipped a little more of it (very little) I decided its just basically there as a bit of fun, to show people what it looks and tastes like before its made into something more drinkable. We don’t get many whisky tasting sessions down in good old Devon, but at some point I might try to pioneer some, though it REALLY not why I am doing this blog. I’d prefer if someone else done some to be honest. However this White Dog, does actually mix quite well with lots of things. Odd.